There’s something incredibly pleasing about natural wood against a fresh white wall. 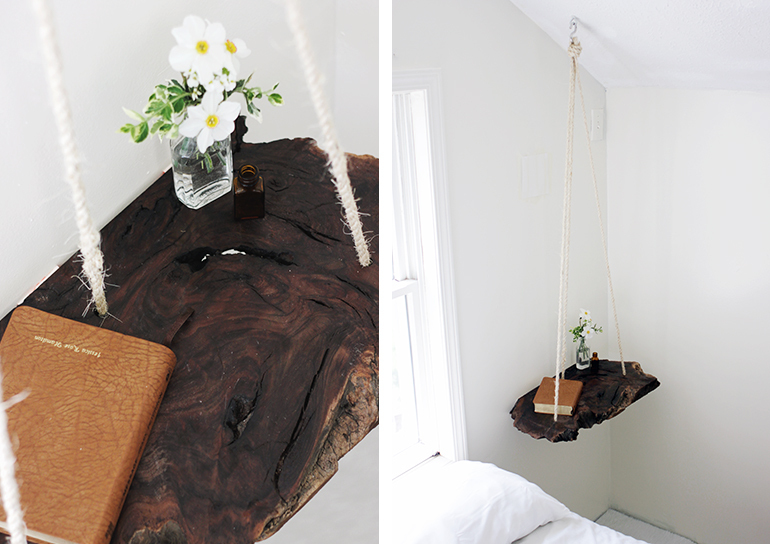 This idea for turning a slice of tree into a hanging bedside table by Caitlin from Merrythought is so simply brilliant I had to share it. She used a piece of black walnut wood that was hanging around in her uncle’s barn, but if you don’t happen to have a stash of tree trunks handy *looks around blankly* I think that one of those natural knarled olive wood chopping boards would work just as well. You can often spot them at artisan markets or try The Rustic Dish, which sells them online. 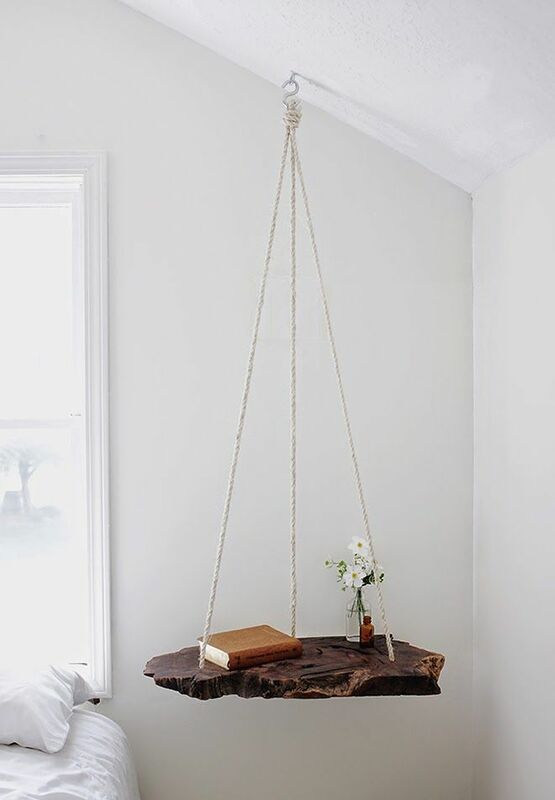 If you’ve been inspired to try making a hanging wooden side table of your own, head over to Merrythought blog for step-by-step instructions and lots of other wonderful DIY ideas. « Summer collection kantha quilts are here! I usually do not leave comments, especially a negative one, but I feel compelled about this. This is without a doubt the most idiotic post of all time. Anyone stupid enough to do this should get what’s coming to them. Definitely a no if you have children or rough guys in your house. For an enchanted fairy house maybe, but fairies are smarter than this. She definitely had enough room to make a legged table out of it. She could have even made a shelf, but she didn’t. She’s ruined a beautiful piece of wood by drilling through it. This sure isn’t an ethical move where beautiful wood is concerned or sustainable, a temporary fix at most. You would also have to screw this into a joist for the correct support, probably splitting the joist in the process. That would be a costly repair. 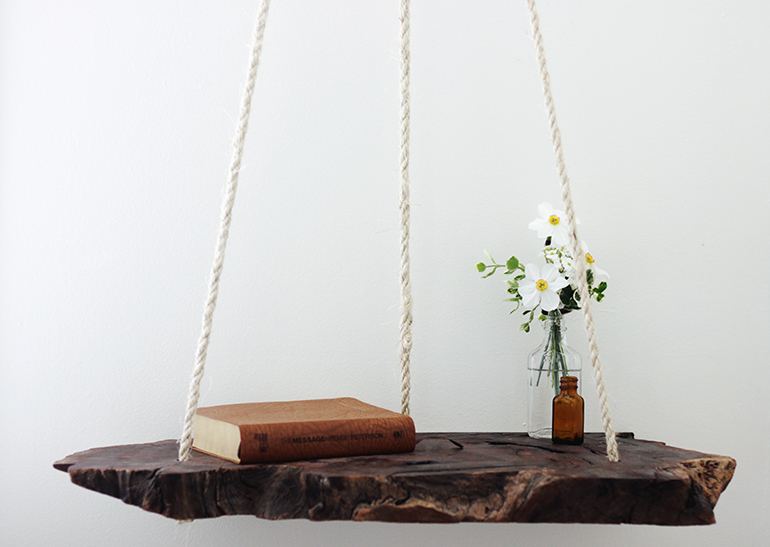 The slab is hung too high to be practical or useful. 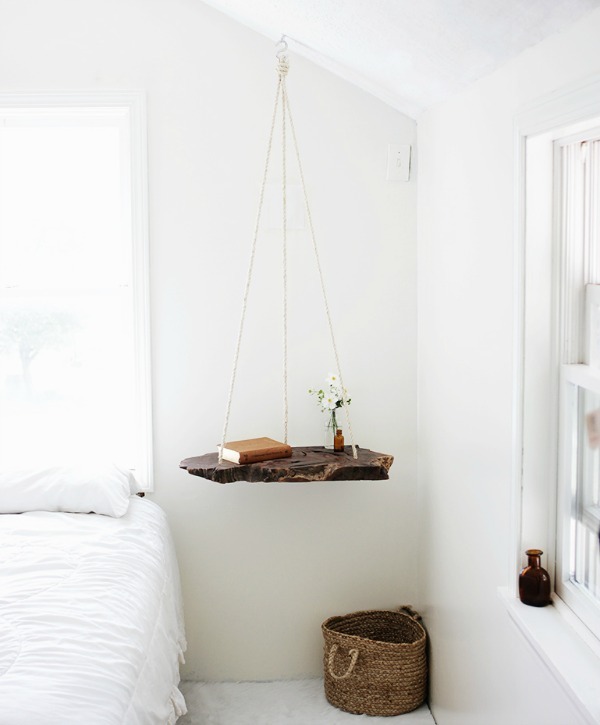 When was the last time you saw a nightstand so much higher than the bed? If she wanted to hang something it should have been curtains in this stark room to cozy it up a bit. And you think this is brilliant? Am I missing something? Wow, Kate… it sounds like we should have posted this in our Room Debate section… you may like to take a look at the archive of those posts and get stuck in! We always love hearing different views on design as it’s such a subjective thing. For me this project is still a great idea – as you say it’s not the most practical solution but for style and innovation it hits the right note for me. If anyone else has any thoughts on this, please do chip in… we do love a good debate! Well, I have to say I mostly agree. It looks like a cat heaven toy. I don’t think the wood is too precious to drill. But one bump and it’s all over the floor. A L shaped bracket or two below the shelf or lucite legs would have actually made the table useful with similar look. Form AND function are a must for my life, I don’t have room or patience for anything else. Otherwise it’s gorgeous. Dude this is beautiful. Looks awesome. I agree it may be better lowered; but only you know that, maybe you would bump it sleeping. The first comment is laughable! I think the height is fine, I’m not too lazy that I can’t prop myself up a bit to but a book on a table. It looks amazing and unique, which draws people to the room.